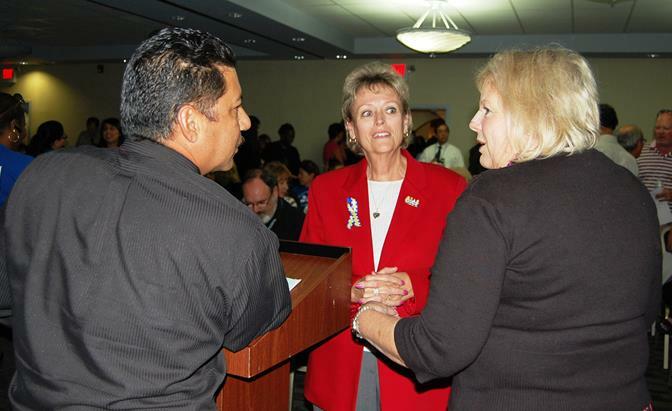 (L to R) Union president Hugo Estrada, former superintendent Nancy Smith and Regina Riley chat before a forum Wednesday evening where Smith alleged budget mismanagement in Palmdale School District. District officials say Smith presented a “narrow version of an analysis of the Palmdale School District budget” with information taken out of context. On October 23rd PETA and CSEA presented their narrow version of an analysis of the Palmdale School District budget. The information was presented by Nancy Smith, retired PSD Superintendent. Mrs. Smith identified Sherilyn Thacker, retired Transportation Director, Becky Velazquez-McIntyre, former Administrative Secretary, and Kathleen Duren, retired SELPA Fiscal Coordinator as persons who assisted in her analysis of the District finances. Mrs. Smith presented a slide show in which she accused the District of being too conservative in budget development. She stated her information was taken directly from Board approved financial reports; however, the “facts” she presented were artificially contrived since they were presented without context and with no designation between restricted versus unrestricted monies. Given that Mrs. Smith was a long-time public school employee and knows the importance of these characteristics, it appears her sole purpose in this presentation was to make inflammatory insinuations against the current school district administration. Mrs. Smith’s primary accusation was the appearance of over-estimating budget amounts that were never adjusted. In fact, the District budget is officially reviewed and adjusted four times each year, at minimum. She never acknowledged the 25% lost revenue imposed on Palmdale School District as a result of the Great Recession that California has suffered the past 6 years. This alone resulted in lost revenue to Palmdale School District of more than $125 million dollars. She failed to mention the generous contingency language the District included in the current labor agreements that automatically restores salary reductions and furlough days should the Unrestricted Ending Fund Balance increase and/or new unrestricted revenue be received. She failed to mention that Palmdale School District is one of the few districts in the State that has managed finances so well during the past 6 years that salary reductions or furlough days were not imposed. She failed to mention that the reductions imposed for 2013-14 have been fully restored and that we have already restored 11.2% of the 12.2% salary reduction intended for 2014-15. Palmdale School District staff has worked diligently to protect the classroom by taking full advantage of the flexibility options offered by the State and the ARRA monies provided by the Federal government. We have intentionally developed a healthy Ending Fund Balance to use specifically to maintain our labor base with as little disruption as possible. The Board of Trustees have made difficult decisions to ensure fiscal solvency for the Palmdale School District that has resulted in increased test scores and new programs for students. It is unfortunate that Mrs. Smith has chosen to assault the good things that have taken place at the Palmdale School District. Please visit our website at www.palmdalesd.org to review the District’s response to the specific items mentioned by Mrs. Smith. View a point-by-point response from the school district on allegations raised at the Oct. 23 meeting here. 12 comments for "PSD responds to allegations of budget mismanagement"
We keep hearing from the District that they have managed finances so well that they have not had to implement furlough days. As a classified employee with PSD I took 8 furlough days just a few years ago. Has the district forgot this? Do any of the so many voting public really believe that superintendent Roger Gallizzi has done anything to forward the education of our children. Has anyone questioned his very lucrative contract should he be terminated? 75% which comes close to $125,000 a year. For being a [removed]. What is happening here folks? Have we really given up to government? If you got fired for being a [removed], would you get a severance of 125,000? With great interest, I am following the politics associated with current Superintendent Roger Galllizzi, with regards to what has been going on with-in the Palmdale School District, as it applies to budget and both classified and certificated employees. But of greater importance is the temporary placement of Pauline Winbush as superintendent of the Palmdale School District. Ms. Winbush has always been a staunch defender of classified and certificated employees. It seems that now that she is the head honcho she too has forgot where she came from and who her greatest supporters have always been. Is it really worth selling out Pauline? Sleazy Gallizzi needs to go, maybe you should too! PSD board again offers flat out diversions to the facts presented. Nancy Smith and her group’s message was simple: the ending balance last year was in the neighborhood of 31 million more than what PSD claimed to have when starting “negotiations”. They also gave false numbers to LA County Office of Education and the mediator and the Fact Finder. Now, our point of view, PSD did not bargain in good faith with either group and imposed a closed contract which means they don’t have to negotiate. The “generous language” assumes that PSD board will be honest about the monies recieved , which has been a continual issue. Lastly, how about some proof PSD? The constant lack of any proof makes everything you say just distraction noise to educated voters. In the classroom they call what Nancy Smith actually said (and backed up): proof. The classroom would call what PSD is saying somewhere between opinion and propaganda. Offer proof or you have nothing to offer voters at all. I am really not studied up on details of what’s going on in PSD. But reading that lengthy, over explanatory, too-detailed eye-glazer of a press release, and the two “Google it” anonymous posts here, and it immediately is apparent that something is rotten at the PSD, and they are in obfuscation mode. I did exactly what you recommended and found nothing in the first five pages of Google search results to support what you say. I know nothing about Nancy Smith or her record, but from what I read here, everything she is saying is backed up with documents and proof. While you seem to be on a smear campaign. Shame on you! Provide links to these so called scandals or zip it. In fact, I am reporting you to the admin for posting false information unless you provide your sources. This type of political mudslinging is the worst of the worst. SMH! I wish I had read the “Google” it responses. They appearantly have been deleted. That’s another flag. I don’t have the option of deleting my posts. How did the “Google it” posts get deleted? Insider, damage control mode by the PSD? Increased test scores? Has no one in the community realized that most, and I do mean most of the schools’ CST scores have dropped? We have no support in the classroom for struggling students and the district is “phasing out” resource teachers. We are not allowed to identify kids that need the help. Is it even legal for a general Ed kindergarten teacher to have 6 identified severely autistic students in the classroom? What about the other 24 kids who deserve an equal opportunity to learn? It’s not teaching when all you are doing is trying to get the special students to not freak out and hurt anyone. Parents, do you want to see all the “great academic” curriculum the district is offering PSD students, talk to your classroom teacher. Ask about what true common core support we are getting, ask about what type of interventions the district offers for kids that are truly struggling, ask about why the ceiling tiles in the classroom have holes from water damage and have not been replaced, ask about why your children aren’t feeling safe on the school buses, ask why kids with extreme behavior are still continued to be allowed in your child’s classroom endangering themselves, your children and the teacher as well. Yes, I am a frustrated teacher, but I am a teacher that cares about her students quality of education. We need classroom support and we need to make this board accountable for every single penny that has been spent during their administration. I would like the Board to explain why they voted to give two furlough days to teachers before the current school year started. Also, they need to explain why the next two furlough days were the Teacher Parent Conferences. Third, the Board needs to explain why the hard medical cap was not taken away when money came in. This response by the Palmdale School District is nothing more than a smoke screen. They are correct that the presentation had a narrow focus. THE BUDGET. Nothing was “contrived” the numbers came from THEIR BOARD ADDOPTED REPORTS that were sent to the Los Angeles County of Education and the State of California and used by the fact finders. I said they misled the Palmdale community. If the board wanted to say we want to end the year with over a 15% ending balance, they should have been honest with the parents and the employees and not publicly claimed they were broke. The district is trying to misdirect and justify that they did the right thing by adopting inaccurate numbers and reports. I was not out to do anything but tell the public about the methodology being used by the PSD to misinform the Palmdale School District community. It had nothing to do with being after the current administration. The accusation that I did not distinguish between unrestricted and restricted in ludicrous. Watch the video of the presentation and see for yourself. The 25% loss of revenue was hard and unfortunate, but had no impact on the current year numbers presented at the END of the school year. Those cuts in revenue had already been accounted for in the June report. Again smoke and mirrors. I did not talk about the language in the “agreement”, because I was not dealing with that document. It is also not an agreement with the teachers, it is an imposed contract that gave the teachers no say in what the board imposed. There was an “agreement” with CSEA, but only after the Palmdale School District threatened to layoff over 400 employees if they did not agree. We offered to have a joint work study session with the board, so that questions could be asked and answered during the regular board meeting. This request was turned down and we were informed that it could be scheduled at a later date. I did not address the curriculum programs in this presentation. THIS WAS A BUDGET ANALYSIS! Again smoke and mirrors. I think it is ironic that the PSD wants to be thanked for “the generous language” in the agreement. There was never a need to impose the furlough days or the % salary cuts. Why would you expect people to be happy to receive MOST of what you took from them and then give it back when they know you didn’t need to take it in the first place. I would be happy to discuss the budget analysis with anyone who wants to learn or has questions. I dealt with nothing but the budget analysis and did not attack any “good things the district has done”. Smoke and mirrors. I never accused the Palmdale School District of being more conservative then I am. Any one who knows me knows that I am a fiscal conservative. I do believe in truth and transparency. Again, the simple way to get out of truth is to throw stuff at a wall and see what sticks. For instance, if I wanted to do what Whodunnit does, I could simply type ridiculous comments about Whodunnit such as: you were charged with drug possession in Dallas Texas in 2012, lost a foot race to Fat Albert in the George Washington School in 1992 and were caught stealing money from an orphanage in 2001 in Alabama. Hopefully no one is foolish enough to take any of this non-backed with fact stuff seriously. Only 1 person has offered any proof and her name is Nancy Smith.